The saying "lucky to be alive" is anything but a cliché when it comes to Shayna Richardson. She began skydiving when she turned 21 in May. Two months ago, in Siloam Springs, Ark., the Joplin, Mo., woman was making her 10th dive and first solo jump with a brand new parachute when things suddenly went wrong. 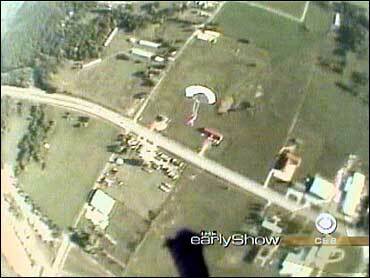 Her main chute and her reserve failed to open properly, and she spiraled out of control, falling thousands of feet. by a camera in her instructor's helmet. She landed face-first in a parking lot and lived to tell about it. "Of course, as high up as I was, I was still about 3,000 feet off the ground, I was gonna give it a try. I was doing everything I knew to do to correct the malfunction. But, ultimately, I was prepared for it to be a fatal accident." It's estimated Richardson was going 50 mph at impact. "I had accepted — I don't know how your brain can process that so quickly in the 3,000 feet that I fell. I had rationalized with myself that this was it, I was gonna die, and there wasn't anything I could do about it. So I just needed to have one last talk with God before I did." Richardson said she doesn't remember hitting the ground. "Really, the last thing I remember was talking to God," she said. "I said, like I said, 'I'm going home. Just don't make it hurt.' And then I don't remember anything until I was in the ambulance. "When I hit the ground, my instructor ran over to me and he said I sat up, was talking to him, and tried to get up and get around. Of course, he made me stay down. But I don't remember any of that conversation. I just kept asking repeatedly if I was dreaming and if I was still alive." Richardson now has 15 plates in her face for fractures after four operations. She also suffered two breaks in her pelvis, as well as a broken right fibula. But there was one shock still to come. Richardson learned in the emergency room that she was two weeks pregnant and, "The baby had survived the free fall as well, survived the free fall and the 50 mile-an-hour impact, and then, on top of that, survived all four surgeries that I've been through as well." The fetus is said to be doing well. Richardson is due in June. "You can't imagine how blessed I feel," she said. "To be alive, and then to have my baby be healthy is just more than I could ever have imagined or expected. I prepared for the worst and I got the best."